The Clarke Library recently acquired a copy of George Catlin’s lithograph, “O-Jib-be-Ways,” a late addition to his American Indian Portfolio. 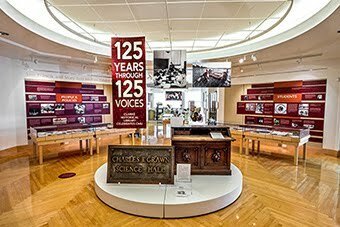 The acquisition was made possible by the Alice C. Webb Memorial Endowment. Catlin’s American Indian Portfolio, published in London in 1844, is rightly hailed as a milestone in the visual documentation of Native Americans. The Portfolio contains the results of Catlin’s years of living with and traveling among the Great Plains Indians. 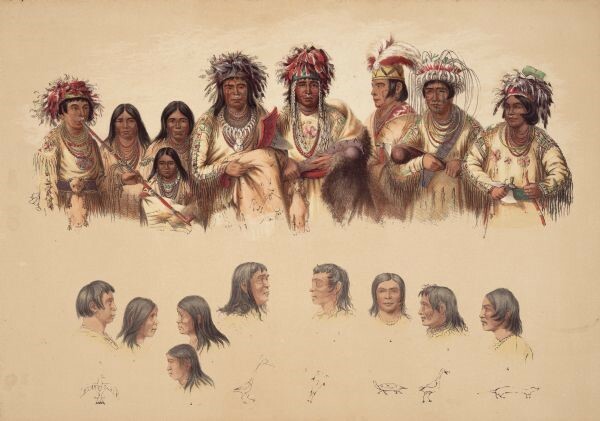 From 1832 to 1837, he traveled west and spent the summer months sketching tribal people. Then, during the winter, he completed his pictures in oils. The more than 500 paintings he created were unique, both in their breadth and also in the sympathetic understanding that his images constantly demonstrate. A selection of images from this body of work were published in the North American Indian Portfolio in an effort to reach as wider audience. Catlin was concerned about the question of who his audience was, because his income came largely from ticket sales generated by exhibiting his work. He spent from 1837 to 1852 touring the United States, England, France, and Holland with his collection of paintings and examples of Indian crafts, allowing the curious to view his exhibit for a fee. His exhibit was sometimes augmented by members of Indian tribes who were also part of the show. How this image came into existence is a story unto itself. The Ojibwas in Catlin’s image were not painted in America, but rather in England. Victorian England’s fashionable elite developed a taste for viewing “exotic” peoples – paying admission to see non-Europeans, dressed in “native” clothing. In 1843, an enterprising showman found a group of Ojibwas from the western end of the Great Lakes willing to leave their homeland and sent them to England. The combination of the paintings and living Ojibwa people made the exhibit a great success. The group was invited to appear before Queen Victoria, to both perform for her Majesty and dine with the Queen. The Queen later thanked her guests by sending them twenty pounds sterling and a length of a plaid in the royal tartan, presumably to be made into blankets. The portrait Catlin painted of the traveling group includes includes symbols corresponding to individuals Totem or signature. Catlin's descriptions and translations, printed on the work, are as follows. "1.) An-que-wee-zaints, the boy chief. 2.) Pat-au-ah-quat-a-wee-be, the driving cloud, war Chief. 3.) Wee-nish-ka-wee-be, the flying Gull. 4.) Sah-man, tobacco. 5.) Gish-e-gosh-gee, the moon light night. 6.) Not-een-a-akm, strong wind, interpreter. 7.) Wos-see-ab-e-neuh-qua, woman. 8.) Nib-nab-e-qua, child. 9.) Ne-bet-neuh-qua, woman." Catlin’s more than 500 original paintings were eventually acquired by the Smithsonian Institution, but were destroyed in a fire that swept the Institution’s building in 1865. What remains of his work are the prints from the Portfolio.